ab10646 does not react with human FGFR2 and FGFR3. Synthetic peptide corresponding to Human FGFR1 aa 360-373 conjugated to Keyhole Limpet Haemocyanin (KLH). Human FGFR1 synthetic peptide with a C-terminally added lysine. IHC-Fr: Human fetal cardiac tissue. ICC/IF: HeLa and NIH/3T3 cells. IHC-P: Human umbilical cord tissue. Fibroblast growth factors (FGFs) are members of a large family of structurally related polypeptides (17-38 kDa) that are potent physiological regulators of growth and differentiation of a wide variety of cells of mesodermal, ectodermal and endodermal origin. FGFs are substantially involved in normal development, wound healing and repair, angiogenesis, a variety of neurotrophic activities, in hematopoiesis as well as in tissue remodeling and maintenance. They also have been implicated in pathological conditions such as tumorigenesis and metastasis. To date, the FGF family consists of at least 23 members designated FGF1 through FGF23. Four genes encoding for high affinity cell surface FGF receptors (FGFRs) have been identified: FGFR1 [flg-1(fms-like gene 1)]; FGFR2 [bek (bacterial expressed kinase gene product)]; FGFR3 (cek-2), and FGFR4. Multiple additional variants (isoforms) arising by alternative splicing have been reported: soluble, secreted, or possibly cleaved forms of FGFR1 and FGFR2 have also been found in body fluids or were artificially constructed, [e.g. a soluble FGF-binding protein containing the extracellular region of FGFR1 and the secreted form of placental alkaline phosphatase (FRAP1)]. FGFRs are members of the tyrosine kinase family of growth factor receptors. They are glycosylated 110- 150 kDa proteins that are constructed of an extracellular ligand binding region with either two (alpha type) or typically three (alpha type) immunoglbulin (Ig)-like domains and an eight amino acid acidic box, a transmembrane region, and a cytoplasmic split tyrosine kinase domain that is activated following ligand binding and receptor dimerization. The ligand binding site of FGFRs is confined to the extracellular Ig-like domains 2 and 3. FGFRs exhibit overlapping recognition and redundant specificity. One receptor type may bind with a similar affinity several of the FGFs. Also one FGF type may bind similarly to several distinct receptors. This accounts for the rather identical effects of different FGF ligands on common cell types. FGF’s binding to cellular FGFRs depend on or is markedly facilitated by the low-affinity interaction of FGF with the polysaccharide component of the cell surface or extracellular matrix heparan sulfate proteoglycans (HSPG). For example, perlecan, a basement membrane HSPG, promotes high affinity binding of FGF2 in vitro and angiogenesis in vivo. Signal transduction by FGFRs requires dimerization or oligomerization and autophosphorylation of the receptors through their tyrosine kinase domain. Subsequent association with cytoplasmic signaling molecules leads to DNA synthesis or differentiation. The signaling and biological responses elicited by distinct FGFRs substantially differ and are dictated by the intracellular domain. At the mRNA level, FGFR1 is highly expressed in developing human tissues including the brain (preferentially in neurons), vascular basement membranes, skin, and bone growth plates. It may be found in most anchorage dependent cells on their membrane and also may be localized around and in nuclei. Pfeiffer syndrome, as well as other disorders of human skeletal development, is the result of a mutation in the extracellular domain of FGFR1. The product is an affinity-purified antibody prepared from pooled sera. Our Abpromise guarantee covers the use of ab10646 in the following tested applications. IHC-P 1/200. Perform enzymatic antigen retrieval before commencing with IHC staining protocol. The epitopes recognized by the antibody are resistant to routine formalin-fixation and paraffin embedding, and to other fixatives e.g. Methacarn, Bouins solution, ethanol and B5. WB 1/400. This was determined by blotting using an extract of FGFR-1 transfected cells. ChIP - Anti-FGFR1 antibody - ChIP Grade (ab10646)Image from Baron O et al., J Biol Chem. 2012 Jun 8;287(24):19827-40. Epub 2012 Apr 18. Fig 6.; doi: 10.1074/jbc.M112.347831; June 8, 2012 The Journal of Biological Chemistry, 287, 19827-19840. ChIP analysis of rat brain lysates, using ab10646 binding FGFR1. Subsequent quantitative PCR analyses of selected potential NBS on the TH gene were performed. CX, cortex; CB, cerebellum; VM, ventral midbrain (containing substantia nigra region); OB, olfactory bulb. Immunohistochemistry (Frozen sections) - Anti-FGFR1 antibody - ChIP Grade (ab10646)Image is courtesy of an anonymous AbReview. Immunohistochemical analysis of PFA-fixed frozen human fetal cardiac tissue, labelling FGFR1 with ab10646 at a dilution of 1/300 incubated for 1 hour at 37°C in 10% goat serum, 0.01% Triton & 0.1% saponin in PBS. Permeabilization was done with 0.1% saponin. Blocking was with 10% goat serum incubated at 37°C for 45 minutes. Secondary was a goat anti-rabbit polyclonal Alexa Fluor® 488 conjugate at 1/600. Immunocytochemical immunofluorescence analysis of methanol fixed HeLa (Human epithelial cell line from cervix adenocarcinoma) cells labelling FGFR1 with ab10646 at a 1/100 dilution. Cells were fixed, then permeabilized. The secondary antibody used was a Goat Anti-Rabbit IgG, Cy3™ conjugate (red). Cells were counterstained with DAPI (blue) to stain nuclei. Immunohistochemical analysis of formalin-fixed paraffin-embedded human umbilical cord sections, labeling FGFR1 with ab10646 at a 5 μg/mL concentration. The secondary used was a biotin-anti-Rabbit IgG Peroxidase. Immunohistochemical analysis of formalin-fixed paraffin-embedded human umbilical cord sections, labeling FGFR1 with ab10646 at a 1/200 dilution. Biotinylated secondary followed by avidin-HRP and AEC substrate, hematoxylin counterstain. Antigen retrieval: 0.1% trypsin for 15 minutes at 37°C. Immunocytochemistry/ Immunofluorescence - Anti-FGFR1 antibody - ChIP Grade (ab10646)Image from Wang YN et al., J Biol Chem. 2012 May 11;287(20):16869-79. Epub 2012 Mar 28. Fig 1.; doi: 10.1074/jbc.M111.314799; May 11, 2012 The Journal of Biological Chemistry, 287, 16869-16879. Immunofluorescence analysis of NIH/3T3 (Mouse embryo fibroblast cell line) cells, staining FGFR1 using ab10646. Top row: Cells were either untreated (left) or treated with FGF2 (50 ng/ml) (right) for 60 minutes. Bottom row: Cells were permeabilized with digitonin, and either untreated (left) or treated with FGF2 (50 ng/ml) (right) for 60 minutes. For diluting these antibodies for western blotting, we recommend PBS, 0.1% Triton X-100, with 1% BSA. 1. I want to use the Anti BDNF antibody for Immunocytochemistry, should I buy the ab108383 antibody which is monoclonal or ab6201 antibody which is poly clonal? 2. If IF is included in applications of an antibody could I use it in flowcytometry technique? 3. I want to use Fgfr1 antibody for Immunocytochemistry should I use ab823 which is monoclonal or ab10646 which is polyclonal? 1. I would like to reassure you that both ab108383 and ab6201 are succesfully tested and therefore covered by the Abcam guarantee in ICC-IF. Therefore, any BDNF antibody tested in the species and application you are using should be suitable for your applications. Also, although we produce many in-house antibodies, we obtain other antibodies from a wide range of sources. Therefore, comparison experiments will not often have been done. If you wish to be more certain, I can suggest choosing the antibody that has been best characterized. By this I mean the antibody that has been tested in the most applications and has the most data available (on the datasheet). Also, ensure to select an antibody tested in the species you will be using. 2. ICC-IF is immunocytochemistry immunofluoresence, staining of cell cultures on slides. This does not mean it has been tested in flow cystometry. Although it is likely to work in flow cytometry, we cannot guarantee this without further testing. You will need to find an antibody specifically stated as tested in flow cytometry. 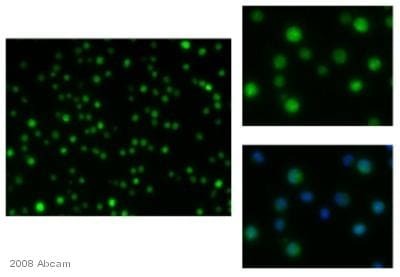 FGFR1 antibody [M19B2] (ab823) has been tested in flow cytometry, so this would be the better option for detection of FFFR1 in flow cytometry and ICC-IF, as it would be covered by our guarnatee in these applications. I am sorry non of our BDNF antibodies has been tested in flow cytometry.All tested applications are specified on our datasheets, and these are updated as soon as any new information is brought to our attention. If you would like to test one of these BDNF antibodies in flow cytometry, please contactme againprior to the purchase by replying to this message as you may be eligible for our testing discount program. 3. In answer to your question regarding whether ab823 and ab10646 would be more suitable for your ICC experiments, I would like to reassure you that these are both tested and guaranteed in ICC-IF. The same would apply as for the answer to the same question for BDNF antibodies (answer 1 above). Thank you for submitting your recent Abreview regarding ab10646. I trust you have received confirmation that your review has been 'published' on Abcam's website. I agree that this vial of ab10646 is not working as expected. If you have received this antibody within 6 months or so of submitting your review, I would be happy to offer you a replacement, credit or refund. In your reply, please let me know the purchase order number or Abcam order reference number associated with this purchase so I can process your request. I want to detect FGFR1 in cultured neonatal cardiac myocytes after I stimulate the cells by FGF2, I want to make sure whether ab10646 is good for immunoprecipitation? I want to detect the expression of FGFR1 in cultured neonatal rat cardiac myocytes by immunoprecipitation. Since the FGFR1 I am going to detect is endogenous, so the amount may not be very much. I want to make sure whether ab10646 could meet my need, i.e., whether ab10646 could detect the endogenous FGFR1 expression? What the size of the expected band(s)? Thank you for your enquery. As far as I can see, the originator has only ever tested this material on transfected cells for immunoblotting. However, I have found the originator's immunoprecipitation conditions which I've attached below. I hope this information is helpful. IP Specificity FGFR-1 ~110kD and 120kD major bands RIPA buffer lysates of non-transfected 293T cultured cells and 293T cultured cells transiently transfected with the plasmid pcDNA3/FGFR-1 (flg). - 500ug lysate protein per immunoprecipitation test and 20ul Sepharose Protein A per test. 8% gels, apply immune complex to one or two lanes (10-well combs). 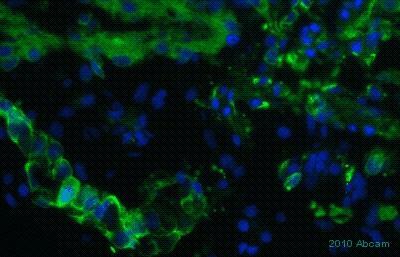 From the datasheet: "Perform enzymatic antigen retrieval before commencing with IHC staining protocol. This was determined by indirect immunoperoxidase staining of trypsin-digested, formalin-fixed, paraffin-embedded human and animal tissue sections. The epitopes recognized by the antibody are resistant to routine formalin-fixation and paraffin embedding, and to other fixatives e.g. Methacarn, Bouins solution, ethanol, and B5." Don't these two statements contradict each other? Thank you for your enquery. The statement does appear to be contradictory. However, I have spoken to the product manager on this. This statement (taken to together with the suggestion of antigen retrieval), means that antigen retrieval is not absolutely necessary but it is still advisable to do so. Our own QC performed antigen retrieval (via trypsinisation) when assaying this material to ensure a response from the antibody. I hope this information helps. Please do not hesitate to contact us if you need anything further.